Technology for butcher’s shops | Sulbana AG – Käserei-, Hygiene- und Verpackungstechnik. For the meat-processing food industry, we offer a high level of expertise when it comes to equipping production plants. 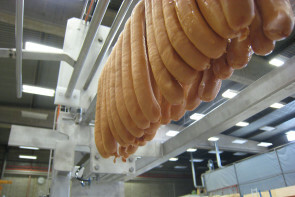 Due to our own ongoing research, patented solutions were developed that are successfully used in international sausage production. We support you, the manufacturer, in planning and costing out new products in your company. With the focus on profitability, individuality and quality, together with you we seek the optimum solution for productivity and hygiene in meat processing.